I have bought these before. They make my Christmas mail look so festive. Has a great "christmassy" theme. I am very happy with these labels. They are attractive and very easy to use. Love peel off labels! I bought these address labels a few years ago, and just re ordered them. They are very nice looking on the outside of a colored envelope of a Christmas card. 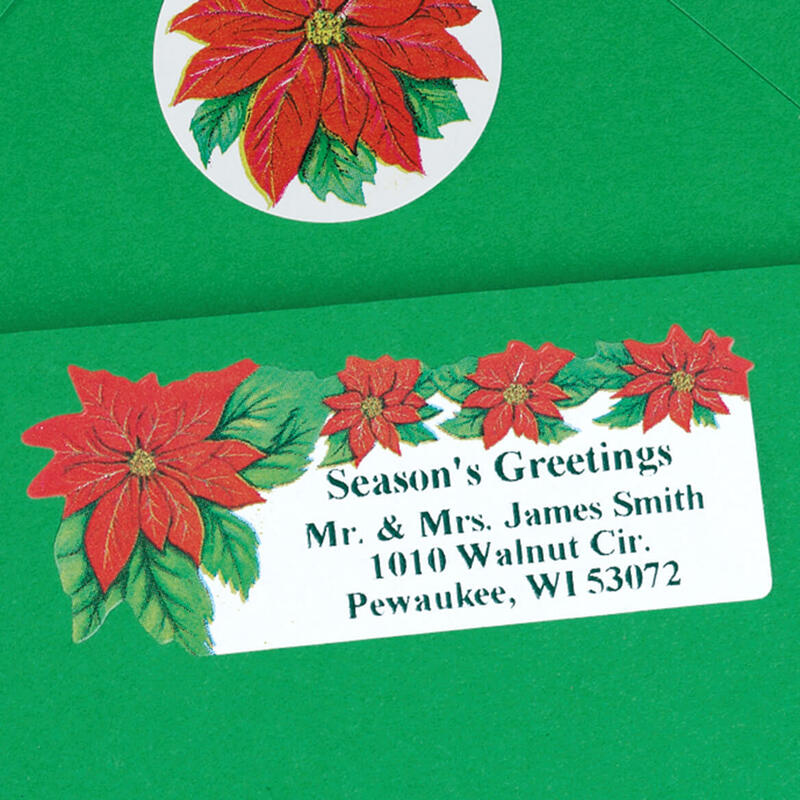 The poinsettia return address labels make a statement, Also like the matching poinsettia seals. Been using them for years. Recently ordered the set because of a new address. Miles Kimball is the best place to shop with outstanding customer service. I use these labels and seals year after year. They make my Christmas mailings look so lovely. I plan to use them forever! 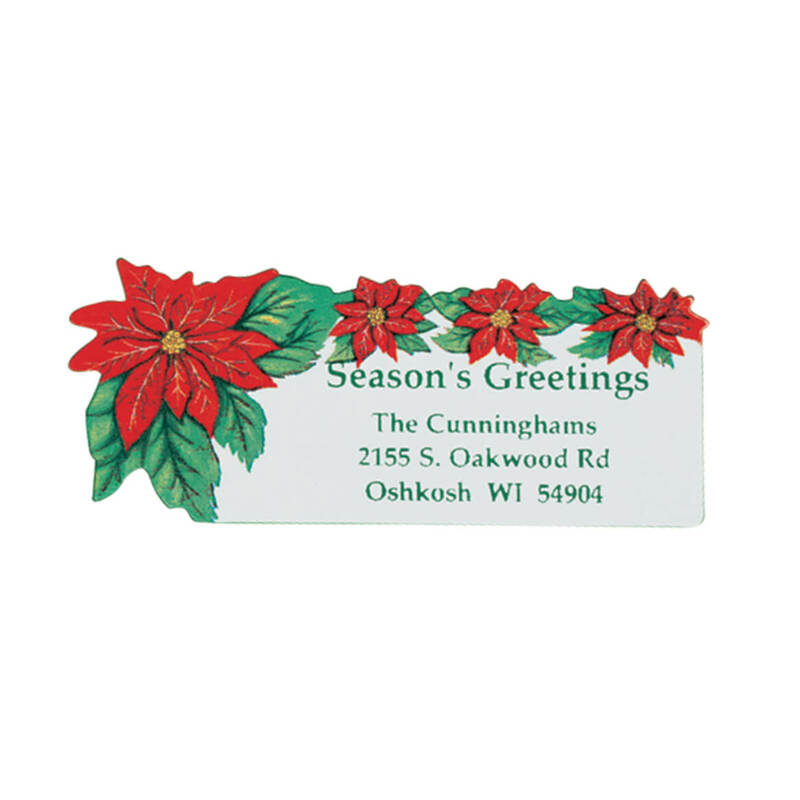 I bought the Poinsettia Christmas return address labels to use on Envelopes to Family and Friends. I like poinsettias and they are very festive and colorful. I also bought the same return address labels several years ago so I wanted to replenish my supply. I also have the matching seals I bought a few years ago. I should have the Poinsettia Christmas Return Address Labels for many years to come. Looking forward to using at Christmas time when i make out my cards. Will save a lot of time. These labels are beautiful. I have been using them for years. Like the labels but would prefer to have them on a roll instead of sheet. These are attractive labels, but I didn't realize that the "Season's Greetings" was part of the design. From the description, I was expecting only my name and address as I specified it. Not a big deal but I probably would have chosen something else had I realized the design wasn't just the poinsettias. But if you want that, they're great. I have purchased these labels many times over the years, but the quality of this latest batch is very poor. The standard typeface is very light and tight, and the ascenders (anything above the line) and descenders (below the line) are broken. For example, there is a gap in the S in "Season's" and the G in "Greetings" at the top of each letter; likewise, the lower "g" in my last name is also broken. The letters are also printed much smaller than in the past. I know they're only labels, but I'm still disappointed given how nice these were in the past. We did not like the address labels nearly as much as our previous purchase in 2007. The print is lighter . The label is smaller and not on a roll. We did not like the sheet format at all. Product is Fine.. followup emails are HORRIBLE!!!! The labels are fine .. I mean they are only labels. I am completely dismayed by the number of Miles Kimball emails I get per day. I am about to cancel my account as your emails do nothing but fill up my inbox. This is the same as SPAM. Why do you think I need so many Miles Kimball products and why do you need to overload me with emails???? Please fix this to where I get ONE EMAIL per week or I will be cancelling my account and use some other company's products that don't drown me with emails. Won't be buying these again! Don't know what's happening to Miles Kimball. These are terrible quality. I have been buying these for years and they come on a sheet; use to come on a roll. I could have printed these at home on my computer at a much less price. I like the colors. I wish they came on a roll instead of a sheet. My wife used this design before and wanted them again. I really like pointsetta's & already have some of these labels. Not happy with these at all. Am sending them back along with my previous labels from you. The new ones are too small and the writing is too pale to read. I love these address labels; use them for all my Christmas cards. I've used these labels for years and am running low on supply. Very easy to use on Christmas greeting cards every year. We liked it so much that we wanted to use them again. I love the red poinsettias, very appropriate for use at any time. Plus free personalization and Miles Kimball quality. I have used this same label for the past several years, love it. I have a ton of cards to mail out this Christmas and want to save time having to handwrite my return address over and over. Have used these in the past. Nice design, will work on any color envelope that comes with our Christmas cards. I have used these labels for years and love the quality. I have been using this same design for 28 years.....I would like to see my final product at checkout. Just shows me the sample labels. So now I don’t know if I’ve made an error in my order or not because it does not show me my final print on the label. I've had these before & love them. We need Christmas return address labels. Labels are beautiful and festive looking. So easy to use....just pull off the sheet roll ! My favorite holiday label. I've used these for years. Looks and previously ordered the same ones. These are the second address labels I've ordered and was very pleased with the first ones. HOW MANY IN A ORDER ? BEST ANSWER: Thank you for your question. It includes of 250 labels. We hope this information will be of help to you.